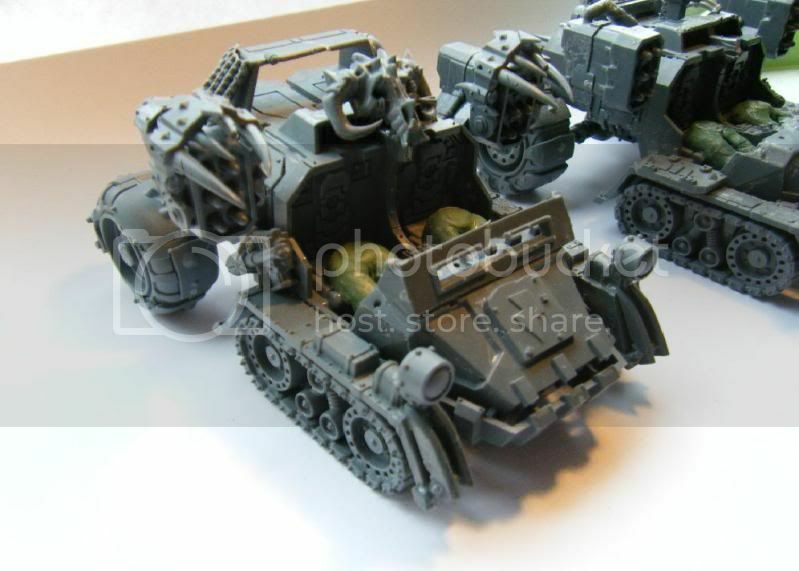 There's still a fair amount to do, but the basic structure on the kopta buggies is there to see. This is the inspiration thread for these. Scratch Battlewagon - Now painted. your 4 wheelers are quality work man. the way you did your speeder.. you could totally pull off making that a scorcha. My Photobucket of Orc stuff. I love your use of the deffkotas to make the buggies. 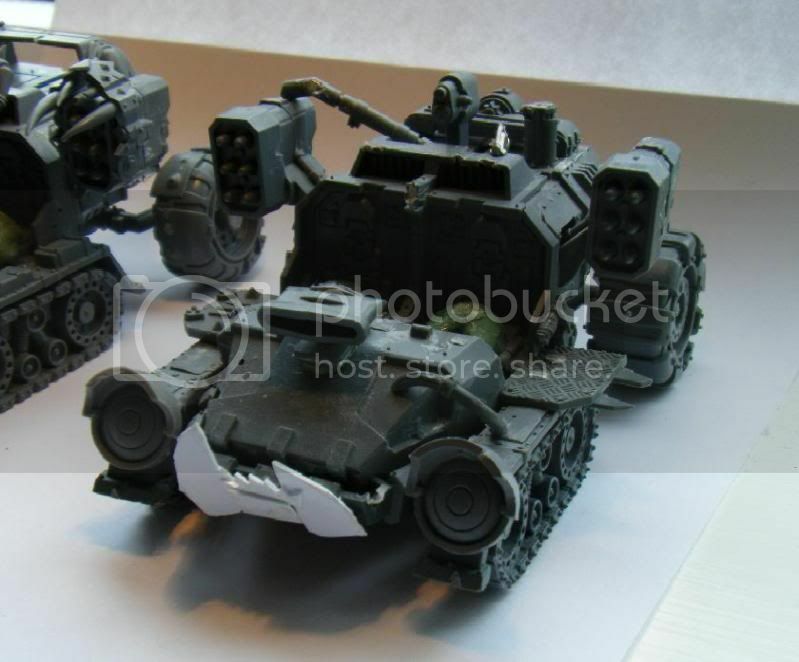 My one suggestion is that you personalize each of them; at present they look uniform and that ain't orky I also like where the speeder is going. My concern with that is without some sort of wheel/track in the front it looks unbalanced at present. Having said that, I don't know what kind of wheels you could use to fix that. Very lootable work! Whining aimlessly is totally my hobby. Cool the wheels go well with the model! I was thinking about using the skis that I chopped off the koptas to put on the front of the speeders so they are resting on something at the front. Nothing is glued together here, just to see how it might look. I wondered about making the weapons magnetic but I think I'm unlikely to use skorchas, I'm bringing these bad boyz for the rokkits. 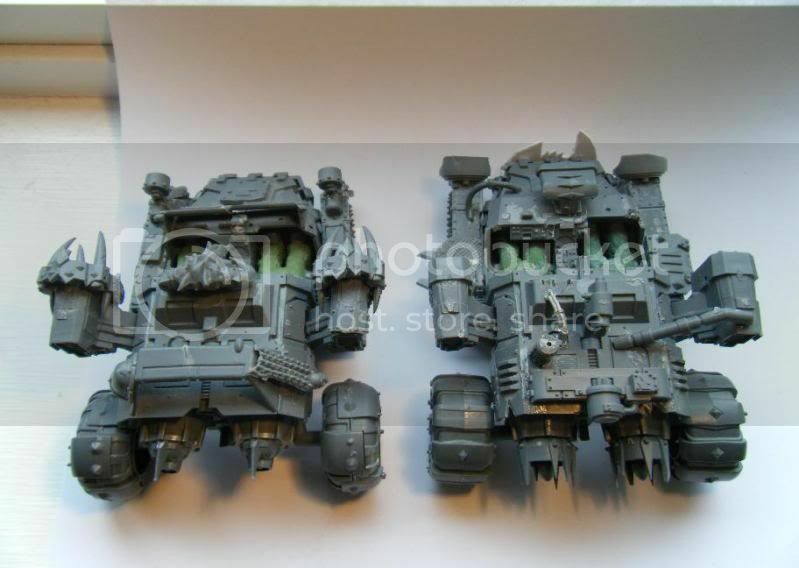 Awesome conversion. 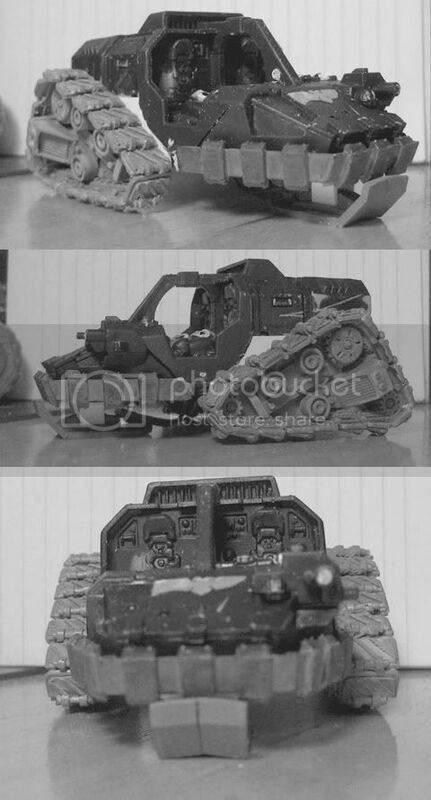 My looted landspeeders feature the trakks at the front, rather then at the back so it's interesting to see them there. DAKKA! DAKKA! DAKKA! DAKKA! DAKKA! DAKKA! DAKKA! DAKKA! DAKKA! DAKKA! DAKKA! DAKKA! DAKKA! DAKKA! DAKKA! DAKKA! DAKKA! DAKKA! DAKKA! DAKKA! DAKKA! DAKKA! DAKKA! DAKKA! DAKKA! DAKKA! DAKKA! DAKKA! DAKKA! DAKKA! DAKKA! Hmm, the back seemed to have more "open space" to put the tracks hence why it's there, but maybe I'll have a look tonight to see how it feels with the tracks at the front. But then what did you use to support the back, wheels? Nice work, think i gonna steel the idea with some modifications, i already got the deffkoptas broken up pretty good, making new ones.. Here's what I did with my landspeeders. 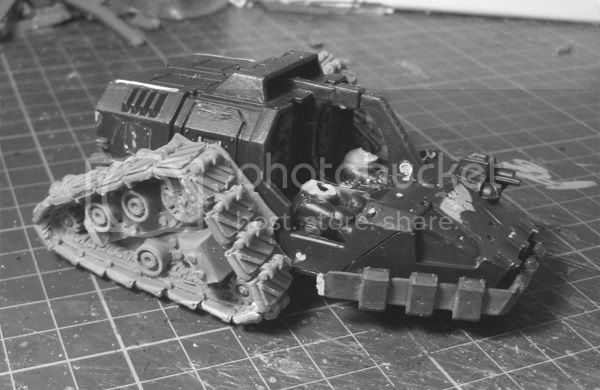 I used wartrakk tracks, with trukk wheels at the back. Forgot to say, I love the quad bikes. 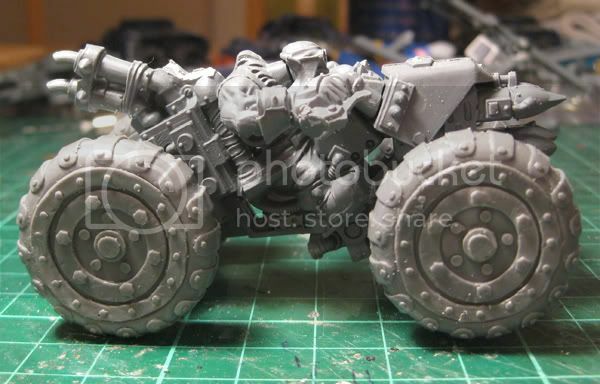 They would make awesome Nob Bikes. "When the pin is removed, Mr Grenade is not your friend!" Wicked! I love the Rokkit Quad Buggies! Keep up the good work! Nice. My trakks are significantly bigger so I think they're more suited to being at the back. You've done a great job detailing those, and I might have to loot your idea of GS'ing over the legs. Does it work with the mono-ski at the front? Possibly. You need something else to break up the front, so as to not have the skids blend in with the "bumper." 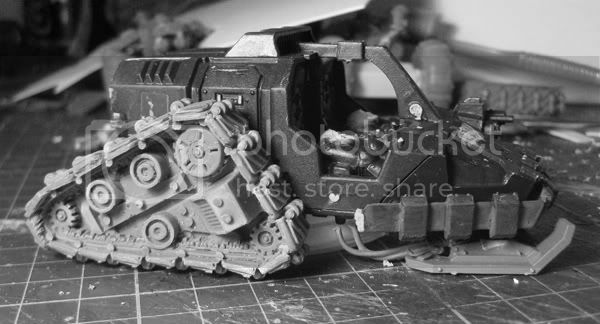 What I would suggest is the same thing I suggest putting on the front of every Ork vehicle. Put a gob on there. That'll break up the parts blending together. Loot anything from the buggies. I've been looting ideas from this site from my days as a lurker. There was a Landspeeder jeep here that was done prior here which I looted the idea from. some great buggies here, love the trakks and the deffkopter conversions. 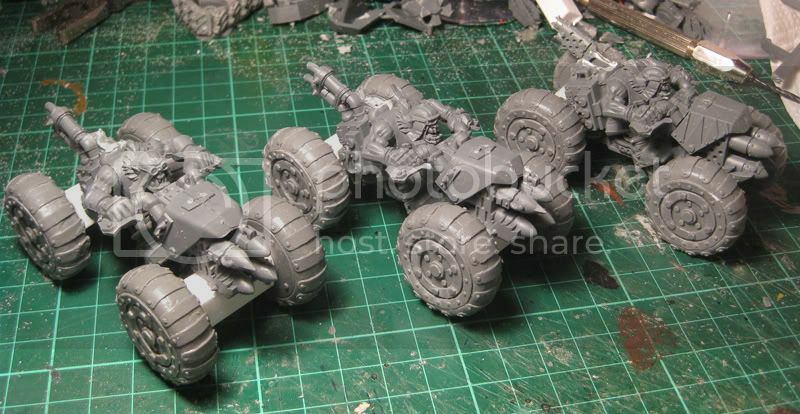 I have done something similar with defkopters but used two blades of the kopter for forks and only one front wheel to make either Nob biker trikes with rokkits (or big shootas) or wartrike buggies, depending on what game i decide to play. They can represent either. If that doesn't work...then you know you're up to your neck in it! I must say I lilke the other 2 buggies better then this one. 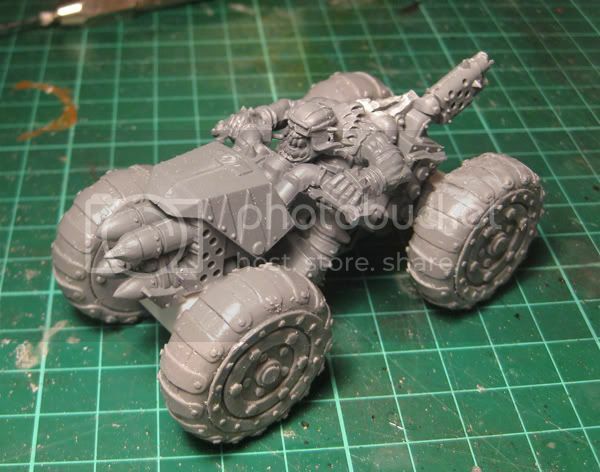 Its a cool Idea but I think it lacks that orkiness to me. I am interested where this might go though. It does and it doesn't for me?? Frustratingly I can kinda see what you are trying for but unless you are only going to play in the snow I don't see them working on rougher terrain so personally I would stick some wheels up the front. Very good work. I have three AoBR deffkoptas in a box, and I don't really want them as deffkoptas (I use 'Deffsoots' instead). I however really like your deffkopta-buggies, and you have inspired me! Now all I need to do is find some good tires. "It is the misfortune of beings to be for us nothing else but useful showcases for the contents of our own minds." My Traitor Guards and Word Bearers! Alternatively I could try standard 2-wheels at the front, but I'll need to find something smaller than what I have at the moment. 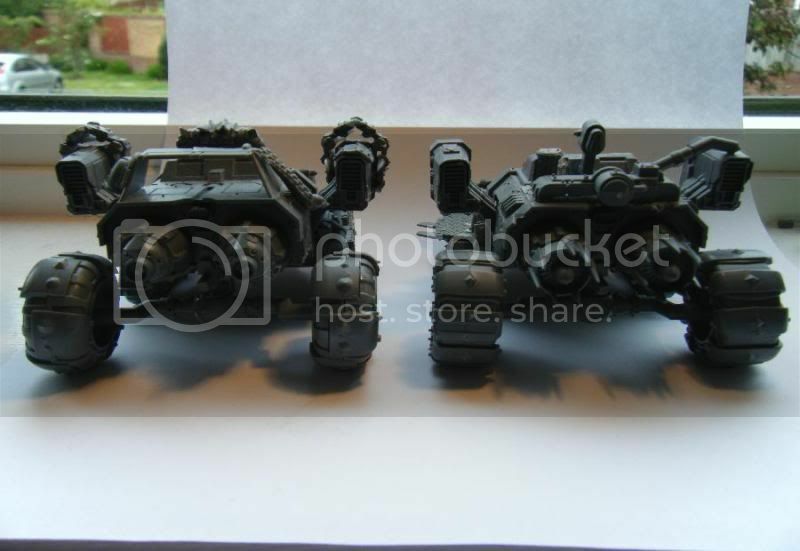 As far as wheels go for the first set of buggies, I can't recommend enough Ramshackle Games for unique bits.